Gilda Gray may or not have invented the Shimmy, but she is the performer most closely identified with that craze of the 1920s, and certainly the one who exploited it the most. Born Marianna Michalska in Krakow on this day in 1901, she moved to Milwaukee with her family at age 8. She wed as a teenager and began dancing in her father-in-law’s saloon, which is where she claimed the Shimmy was born. 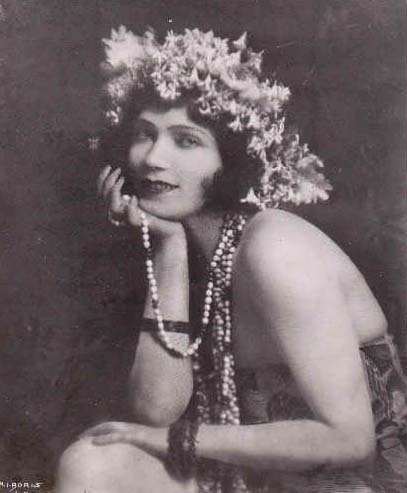 She moved to Chicago and performed in vaudeville briefly with a woman named Mildred Vernon, before moving on to New York and working as a single. By the late teens and twenties, the Shimmy was a craze, and it brought Gray featured parts in numerous Broadway revues, and starring roles in many films. By the 30s, her career was in a drastic decline — the Roaring Twenties were over. She passed away in 1959. (If you find the post in any way dissatisfying, here is a much better and more thorough post by the Countess).